Wladimir Klitschko does not believe that the time a young Anthony Joshua once spent in his training camp gives the IBF heavyweight champion an advantage in their fight next year. The two are set to fight for Joshua's IBF belt and the vacant WBA title when they meet at Wembley Stadium in London on 29 April. Joshua, 27, observed Klitschko's techniques at the Ukrainian's training base in Austria two years ago. "I'm happy to share," said Klitschko. "Any person or sparring partner that got into my training camp, getting a feeling for it, learning: it's fine, I want people to learn from it. "It's definitely good for him, because he saw how a top athlete and champion is preparing." 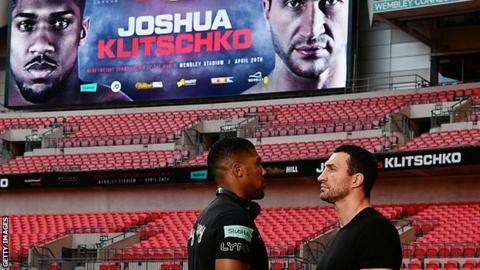 Klitschko was also asked why he had agreed to fight Joshua having previously said he was willing to wait as long as necessary to pursue a rematch with Tyson Fury. Fury, 28, beat Klitschko on points in November last year to take his WBO, WBA and IBF titles. The original rematch, scheduled for 9 July at Manchester Arena, was postponed in June after Fury injured his ankle. The rearranged rematch - with the WBA and WBO belts on the line - had been scheduled for 29 October but that was postponed for a second time because Fury was "medically unfit". The Manchester fighter is currently banned from fighting after the British Boxing Board of Control temporarily revoked his licence. "I feel sorry for him so it's not a topic anymore to even talk about it," added Klitschko. "I was just focused on one thing: getting my revenge. No-one was interesting to me. "Since that doesn't exist anymore, I'm looking around, and it's 'Here we go, there's Anthony, a champion', and he's absolutely a knockout machine. It's perfect - the timing is perfect."